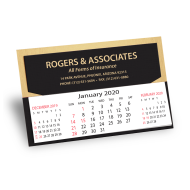 Imprinted desk calendars are an attractive and affordable way to promote your brand for the next 12 months. 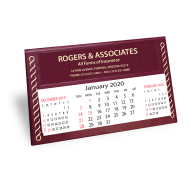 This small desk-friendly format has become a favorite for any company interested in running a successful business-to-business promotional campaign and looking to solidify brand recognition. 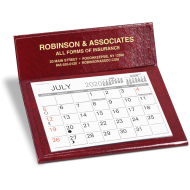 Desk calendars are a standard feature in many offices. Easily accessible to flip through and check dates while on a phone call, they’re an essential tool in the workspace—which makes them a winning marketing tool for your business. 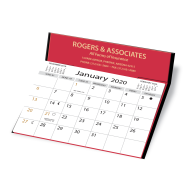 Best of all, promotional desk calendars have a large area for your company’s imprinted logo – often stamped in gold or silver foil – so it will stand out all year long. Give your company powerful promotional exposure for an entire year with this time-proven marketing tool!